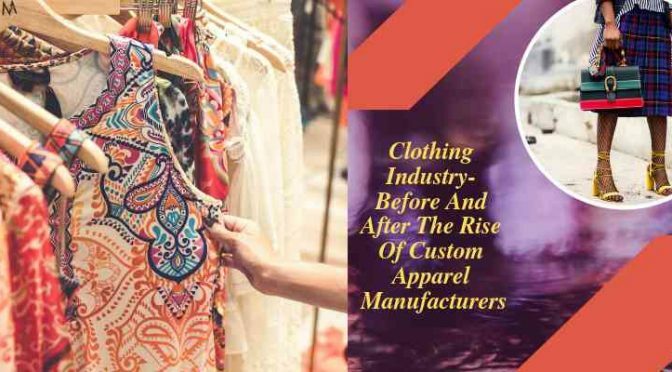 At a time when market competition is at its all time high with no good news awaiting for the retailers, custom clothing manufacturing companies has emerged to be a game-changer. Providing opportunities to the small players whose existence is always on the edge in front of the ‘big boys’, many private label brands have surfaced on the scene that already boast a good consumer support—customers who are looking for something different, unique and fresh. The face of the global clothing industry has changed today; now an open-field where small apparel brands and e-commerce platforms enjoys larger prospect of success. No more are they at the threat of getting squished by big manufacturing and marketing budgets of well-established apparel brands. With a distinct collection and hyper niche market to target, small businesses enjoy significant trust and rapport from their target consumers, which transcends well financially. Are you making the most of this shift in the clothing industry? Are you a clothing business owner? Just started a new online apparel store? Picked a very competitive market niche? Don’t have huge budget to spare extravagantly on marketing? Wondering how you can ever compete with the world’s top brands? Like mentioned, the field is much more open today, with opportunities in heaps for the clothing startups. However, few things must be kept in mind and followed to make the most of this shift in the apparel industry. You must know what your competitors are offering and stock wears a slight bit different to that—that makes your collection unique and at the same time matches the need of your target customers sufficiently. So pick a good custom clothing manufacturing company that offers wide options to personalize your bulk order. Going micro in the selection of your target consumers will mean less competition, which will result in better sales. Like for example, when picking fitness wears niche, go with just the men; segregate men in different groups on the basis of their age, preference, budget and location. And they pick one small market. As you go, you expand. You don’t need big marketing budget. However it is necessary to have a good digital standing even if you just deal through brick-mortar stores. Social media and search engine marketing is important; but don’t run after the numbers (traffic, fans, followers). At the beginning, conversion rate is your foremost KPI to prioritize. With these 3 simple ways, beating even high competition in the clothing market is much easier for the small clothing businesses today. In fact, much like apparel industry, other markets too have opened up in recent times with big available opportunities for startups to scale and sustain among big competitors, courtesy of top custom wholesale shoe suppliers, accessories manufacturers and other made-to-order production companies.